This Perm is only available on Wednesdays, Fridays, Saturdays and Sundays, as that's when the Eureka cafe on the Wirral is open. The route has been revised in 2019 to remove some controls with limited availability, so expect a diversion to Ellesmere after crossing the Dee at Bangor-ys-y-coed. The permanent version of the calendar event, normally run in November so a chance to ride it again perhaps in better weather. Visit the legendary cyclist's cafe using some surprisingly quiet lanes skirting Warrington, Chester, Wrexham and Crewe. The start is from the petrol station at Dean Row, before heading through Wilmslow to pass under the airport runway using the cyclist's tunnels. Quiet lanes take you Rostherne, High Legh and Stretton with its Young Offenders' Unit. The stretch through Frodsham and Helsby uses the A56 but the presense of the nearby motorway should keep the roads fairly quiet. After a stop at Eureka cyclists' cafe (open Wednesdays and Friday-Sunday) you skirt the west side of Chester, crossing into Wales using the Dee footbridge at Saltney. 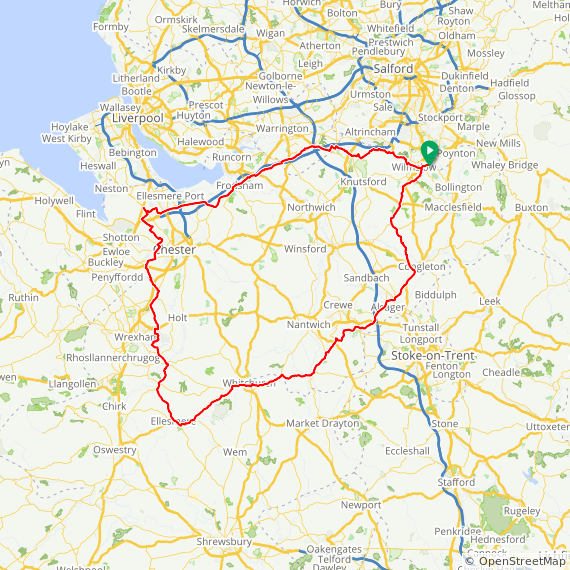 The traditional route was revised in 2019 to cater for plenty of changes to roads and controls that have occurred over the 13 years that this ride has been in existence. Instead the ride now continues after Bangor-on-Dee to Ellesmere, before rejoining the original route at Astbury.